DALLAS (BRAIN) — Playtri Franchising LLC, a Dallas-based retailer and franchiser, has acquired Endurance House International LLC, a Madison, Wisconsin-based franchiser. 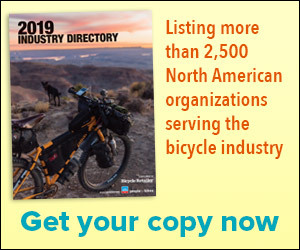 CHEROKEE, N.C. (BRAIN) — Motion Makers Bicycle Shop, which has stores in Sylva and Asheville, is opening a third location, in Cherokee, on June 16. Motion Makers is partnering with Outdoor 76, an outdoor sports store, on the location on Big Cove Road. FOUNTAIN VALLEY, Calif. (BRAIN) — Pedego Electric Bikes has opened six new stores across Canada, bringing the total number of Canadian Pedego stores to eight and the total worldwide to 132. Gosselin was previously the North American sales manager at Reynolds Cycling. His role at TPC will focus on nurturing IBD and OEM relations, the company said. SEATTLE (BRAIN) — The bike community across the country is mourning the death of SJ Brooks, who died in a cougar attack while mountain biking near Seattle last Saturday. Brooks worked at shops in Seattle and Boston and for Seven Cycles. Brooks was a co-founder of the Seattle chapter of the Friends on Bikes organization and a former board member of Bikes Not Bombs. Move allows retailer to purchase its own building and expand fit studio. EDGEWATER, Md. (BRAIN) — Parvilla Cycles held a grand opening celebration on Saturday, May 19, following the retailer’s move to a larger location it purchased in Edgewater, Maryland. The 7-year-old store moved only a short distance but was able to double its space and expand its fitting studio. LAGUNA NIGUEL, Calif. (BRAIN) — Multisport retailer Endurance House Orange County has closed, and the store’s assets will be sold at auction starting Wednesday morning, May 23.